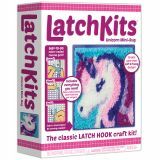 This classic and easy-to-learn craft kit is sure to be a hit with unicorn lovers! Everything included to loop, hook, and pull a mini rug or wall hanging. The color-coded canvas and pre-cut yarn makes getting started on your project a snap.